Still Smoking? Will Smoking Affect Your Health Insurance? Cigarette smoking is the leading cause of preventable disease and death in the United States, accounting for more than 480,000 deaths every year, or about 1 in 5 deaths. Nearly 23 percent of high school students use tobacco products, and more than 90 percent of those teens smoke cigarettes, cigars, hookahs or pipes, according to the report from the U.S. CDC. More than 15 of every 100 U.S. adults aged 18 years or older (15.5%) currently smoke cigarettes. This means an estimated 37.8 million adults in the United States currently smoke cigarettes. More than 16 million Americans live with a smoking-related disease. Current smoking has declined from 20.9% (nearly 21 of every 100 adults) in 2005 to 15.5% (more than 15 of every 100 adults) today. The proportion of ever smokers who had quit increased; however, current smoking prevalence did not change significantly today. COPD is the third leading cause of death in the United States. More than 11 million people have been diagnosed with COPD, but millions more may have the disease without even knowing it. Yes. Smoking will certainly raise your insurance rates. There are certainly numerous data available that proves that smokers are costing insurance companies more money than their non-smoking counterparts. Health insurance companies use studies and data to determine an individual’s health insurance rate. The risks presented by a client decide their premiums or rates. Those with lifestyle, health, or other issues that may cause them to need more expensive health care procedures at a later point in life will be charged with higher premiums to balance this risk. Although many smokers have quit, there are many more who find it hard to do so. Smoker statistics encompass less-educated, rural, and lower-income Americans. Historically and today, many teenagers smoke to look cool to their peers, and control their weight. And like many ex-smokers, teens engage in a long-standing habit that is difficult to break. Down south, where tobacco is a staple product, smoking is being curtailed but it is more prevalent in public than by our northern neighbors. But it’s slowly changing. New bans in restaurants, bars, inside and outside of city offices and institutions, non-smoking areas are popping up all over. If you still smoke, have you tried or wanted to quit? If so, if you are like most folks, you have probably tried more than once to end your smoking habit. Maybe even twice, three times or even more. Smoking is one of the hardest habits to break. It is an addiction both psychologically and physically. If you are smoker and desire to quit, you have to be the one who wants to. You can’t quit for your wife or mother, or husband, or girlfriend, or boss. You have to really want to quit. Here’s one way to break the habit if you don’t want to quit cold turkey. It works for a lot of people. What is it? You purposely decrease the amount you smoke and the times (habit) when you smoke. Here’s how that works. You pick a day when you are ready to start your quitting. Count how many cigarettes you habitually smoke a day and when and keep a journal of the amount and habit-time situations. Say you smoke 20 cigarettes or one pack a day. The day you are ready to start your quit program, take 10 cigarettes out of a pack and ration yourself through the day to smoke only those 10. To non-smokers, this seems like a lot. To a smoker – it is hard work to cut their supply in half. Cut out the early morning one and the ones in your car. When you do feel like having a cigarette, don’t light up right away — tell yourself you’ll have it in 5 minutes. Keep decreasing and delaying. 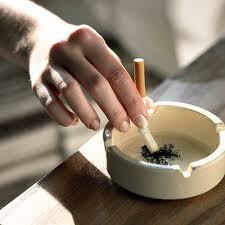 It helps break your ‘smoke habit times’ as well as decreasing the nicotine addiction in your body. When you are smoking ten cigarettes a day and not wigging out, reduce that down to 5 or 3 cigarettes a day. These will be ones you will crave the most. Cut out the after meal smokes or the ‘habit’ of smoking after meals will be stronger when you do quit for good. You’re trying to break the psychological ‘when’ as well as the numbers. You will eventually quit. Try not to mingle with your ‘smoking buddies’ while you are doing this way of quitting. Temptations of social smoking increase with a glass of wine in your hands. Eventually the 3 to 5 cigarettes will sustain you. The day will come, depending on your will and readiness, when you’re down to 3, 2 or 1 cigarette a day – and it’s easier now and only you can decide what day that is – to give them up completely with little withdrawal. Don’t rationalize that you are ‘smoking much less’ — it’s still smoking. You can do this. Others have quit this way and have never gone back. Join them. Make this the year you can say, “I gave up smoking”.